Need some tips for your new flock? Find out how to maximize egg production in hens. 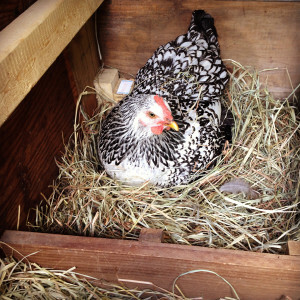 Healthy hens will begin laying at about 18 to 20 weeks of age. It is not necessary for a rooster to be present for egg laying to start, but without a rooster, all eggs will be unfertilized. Hens will be at peak production at about 30 weeks. Excellent production would be considered 80 percent to 90 percent, (100 percent is considered 1 egg per hen per day), but breed, housing, weather, management, parasite load and nutrition can all affect rate of lay. Eggs should be gathered three times daily, more often in hot weather. Store the eggs at 55oF and 70 percent to 75 percent humidity if you plan to keep them for hatching. Eggs for eating should be refrigerated. Eggs are laid with a protective coating, which helps to keep bacteria out, and it is best if this is not disturbed. Excessive washing can force bacteria through pores in the shell and into the egg, greatly reducing its chance for successful incubation and hatching. If washing is necessary, be gentle and quick, and use only water. Be sure to use water that is warmer than the egg. Dry and cool the eggs as quickly as possible. it lessens the opportunity for hens to learn the bad habit of egg eating. This entry was posted on Monday, April 16th, 2018 at 1:12 pm	and is filed under Chicks, News & Update. You can follow any responses to this entry through the RSS 2.0 feed. You can skip to the end and leave a response. Pinging is currently not allowed.